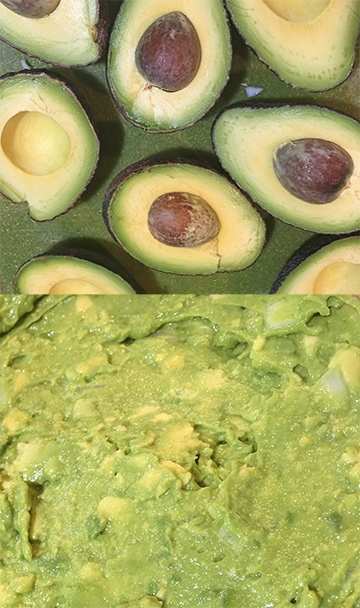 Halve avocados and remove pit. Mince onions, Slice lemon in half. Use a fork to scoop out avocado from skin into a large bowl. Use a hand masher or give it a couple quick swirls with an immersion blender. Quickly add juice of 1/2 lemon. Season with 1/4 tsp vinegar and salt to make the flavors pop. Add onion, stir well then adjust lemon/salt to taste. If you're not serving it right away, squeeze extra lemon juice on the top and place an avocado pit in the center. * Did you know that onions actually help guacamole keep it's green?!? Besides tasting delicious this little trick will help your leftovers look great too!